Mr Ease Cartel (outside) holds off fastest qualifier Henoshersecret by a nose to win the El Primero Del Ano Derby on Sunday at Los Alamitos. 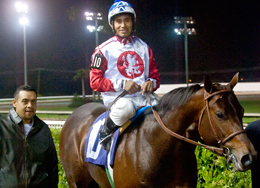 LOS ALAMITOS, CA—APRIL 7, 2013—Racing for the partnership of Mike Abraham, Balgo Racing Team, David and Ross Hinkins, R.D. 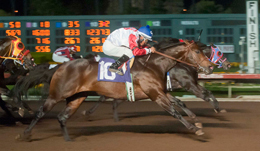 Hubbard and Billy Smith, Mr Ease Cartel held off fastest qualifier Henoshersecret by a nose to win the $205,900 El Primero Del Ano Derby(G2) on Sunday at Los Alamitos. Ridden by Cruz Mendez from the outside post number 10 for trainer Jose Flores, Mr Ease Cartel had the lead from start to finish on the way to covering the 400 yards in :19.678. The son of Corona Cartel was picking his fourth win in a row and his third in as many starts this season. He won his derby trial by a half-length in his previous start. Mr Ease Cartel flew out of the gate to a clear length advantage over Tell Of The Past and Henoshersecret. He then began to drift out a little bit according to his connections, but Mendez quickly straightened him out and from there the colt did enough to fend off a strong finish from Henoshersecret. Winning trainer Jose Flores and jockey Cruz Mendez walk into the winner's circle with Mr Ease Cartel. Abraham won the El Primero with PK Fire in 2011 and when he first visited Los Alamitos Race Course he finished second in this race with Sparkling Moolah to Jet View in 1981. All the other partners on Mr Ease Cartel were picking up their first win in the El Primero. David Hinkins did not seem to mind the outside post as much. Mr Ease Cartel, who finished third in last year’s Kindergarten Futurity, earned $86,478 for this win to take his lifetime earnings to $135,127. His record now stands at five wins in seven starts. For Flores, this was his second El Primero Del Ano victory after winning the 2010 edition with Headturner. 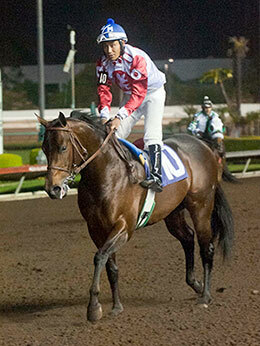 Thompson Racing, Inc. and Paul Jones’ Henoshersecret earned $35,003 for his second place finish in the El Primero. The colt by No Secrets Here enjoyed his best result in a stakes race after finishing out of the money in his two previous stakes outings. “He was lugging out, but he ran a very good race” Jones added. Racing for the Estate of Kim Kessinger, Tell Of The Past posted a solid effort on the way to running third. Winner of the John Deere California Juvenile last year, the Teller Cartel gelding earned $24,708 to more than double his career earnings. He has now made $46,526 in his seven race career. Juan Andrade rode the gelding for trainer Joe Bassett. Jaime Gomez’s Tres Primeros finished fourth and was followed across the wire by Sugarbear Sax Man, Freedom Choice, Tiny Flying Corona, Votemout and Perrys Affair.